Skal International Chiang Mai president Annette Kunigagon is presented with a Membership Development Certificate on behalf of her club, by Skal International Thailand president Andrew J Wood (third from right). 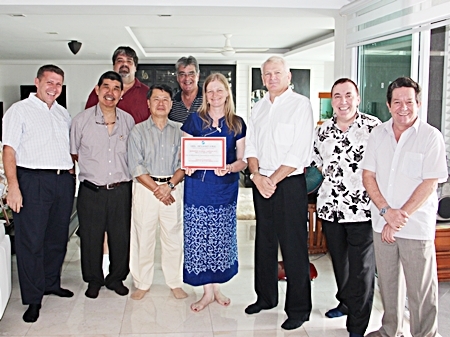 The certificate recognises Annette’s remarkable efforts in recruiting new Skal members in Chiang Mai and Northern Thailand (more than 10 percent in the past 12 months), leading her dedicated volunteers that make up the Chiang Mai club’s executives. The presentation took place during the half-yearly meeting of the Skal Thailand executive committee. Also pictured, left to right, are Claude Sauter, Somsak Kiratipanich, Scott Smith, Jaffee Yee, Dale Lawrence, Brinley Waddell and Bob Lee. The meeting was held on Saturday 3rd November in Bangkok. Skal International currently has some 18,000 members worldwide in 85 nations & territories. 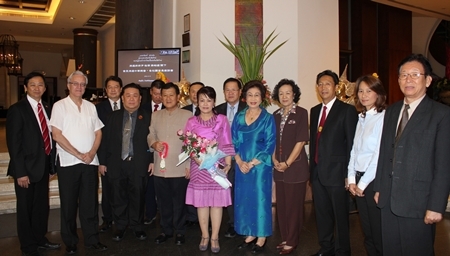 Governor Tanin Subhasaen is joined by General Manager of the Imperial Mae Ping Hotel Peter H. Snyder and leaders of the local Chinese community at the inaugural meeting of the Thai Chinese in Thailand held in the Grand Imperial Hall at the Imperial Mae Ping recently. 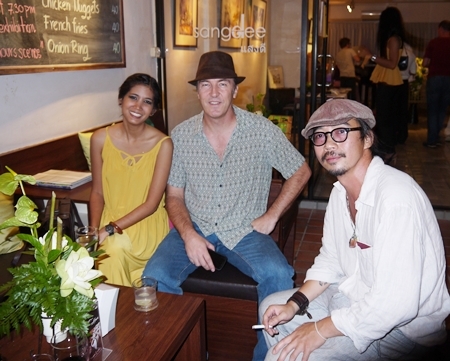 Local artist Sinfaii Chaiyasith is joined by Gregory Kennedy and artist Sawan Yangwhe at Sangdee Gallery on Sirimangkalajarn Soi 5 for an art exhibition opening recently. 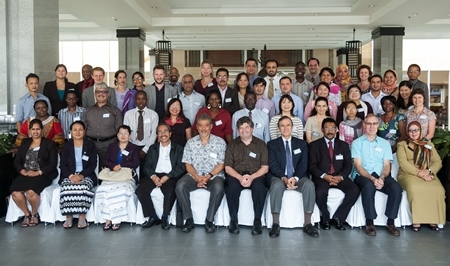 Kantary Hills Hotel, Chiang Mai General Manager Magrin Promyothi (blue shirt, center back row), warmly welcomed the participants from Help Age International and the Economic Policy Research Institute during their workshop on “Designing and Implementing Social Transfer Programmes”, which was held recently at the hotel. M & M organizer Donjai Srivichainanda is joined by friends at the opening of the Jazz for Better Days charity concert held at the CMU Art Center. The event was held to raise funds for the music program at Juvenile Observation and Protection Center, Chiang Mai. 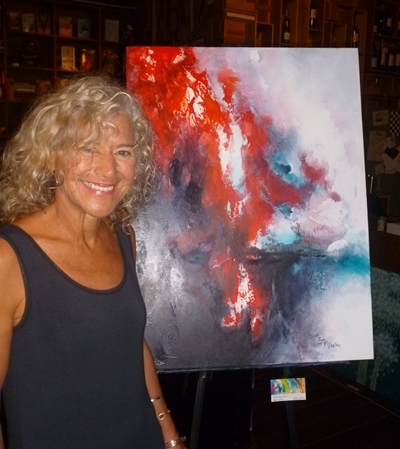 Jennie McGuire held the opening of her exhibition titled “Chasing Light” at the Meeting Room Art Café on Charoenrat Road, on Saturday, November 3, 2012. Local musician Ralph Thomas joined Jennie to entertain at the evening which saw a large turnout of fans of her colorful and evocative works.